Planning a wedding is frustrating on its own, but add in a meat-free, dairy-free, vegan reception and you're just asking for trouble; whether it's dealing with opinionated parents, explaining veganism to caterers, or finding just the right vegan cake. The following pages are designed to help make your special day easier. Planning an animal-free wedding involves the same steps as a regular wedding, but requires researching a few more details along the way. But, it's incredibly rewarding on your wedding day when people are raving about your amazing food and asking about veganism. The biggest challenge you will likely need to overcome is before the wedding, when you will sculpt the perceptions of others about the food. Keep in mind that most people assume vegan food is bland, if not completely disgusting. Parents might feel they will be embarrassed by leaving meat and seafood off the menu, and might feel they will insult their guests. 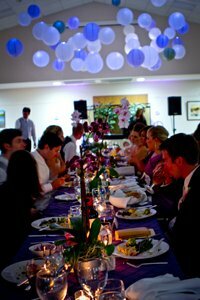 And guests might feel tricked if they don't know about the menu beforehand. 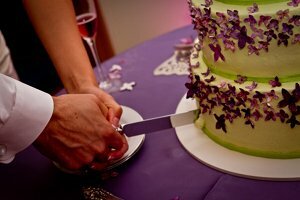 Learn about my vegan wedding food and cake, and how I handled the skeptics before the wedding. You know, those people who don't think they can go one meal without some type of meat on their plate. And, those well-meaning relatives who have a lot of opinions. The best thing you can do is ensure that your menu is absolutely delicious. Even though most of us have likely been to many weddings with sub-par food, remember that your menu will be scrutinized on a whole new level. People will assume that all vegan food tastes just like whatever you serve them, especially if this is their first taste of it. What that means is that hosting a wedding without animal products gives you an amazing chance to spread the word about vegan food. If you maintain a positive attitude and excitement about your wedding food, everything will be fine. Letting everyone know that you are making a huge impact on the environment by opting not to serve meat will be a home run since so many people are interested in having eco-friendly weddings. One of the most fun parts of planning any wedding is selecting your vegan wedding cake. The word "vegan" is becoming more and more commonplace-- you see vegan foods in every grocery store, vegan cakes and cupcakes at your local bakery, and every sort of food made vegan in restaurants. Most bakeries can make a vegan cake, or can be taught how to do it. Once your wedding food is selected, you only need to worry about smaller details, like flowers, dresses, and wedding favors.